When I was a child, I always thought mowing the lawn looked cool. When I was old enough to help at home, my father would let me use the push mower to help mow our back yard but I don’t think I ever really understood the dangers of those mowers and just how sharp those blades were until years later when I was a pediatric resident working in the ER with grass in full bloom. I saw fingers and legs sliced in ways unimaginable, some from foreign bodies kicked up from the mower. But, the worst lawn mower accident by far was a cute little boy who had fallen off a riding mower. Despite his father’s quick reaction at hitting the power kill switch, the child’s leg was horribly damaged by the blade. He’s very, very lucky he didn’t end up losing it. “Try to use a mower with a control that stops the mower from moving forward if the handle is let go. By the way, the best way to keep small kids safe while a a grown up is mowing the lawn is to have the kids indoors or on a deck supervised. Rocks, sticks and all sorts of things can get tossed out from under a mower and also cause damages, as the University of Michigan Health Minute reminds us. 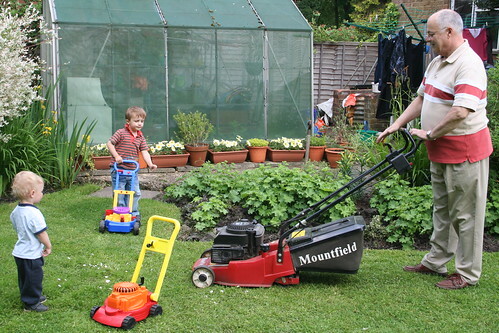 Given how many pictures I found online of kids pushing grownup mowers with their dads and grandpas, this is an important issue to talk about. Plus, I still can’t shake the image of that cute boy I saw all those years ago in the ER. Let’s all do what we can to make sure those type of images become history.